Sometimes people are lucky enough to have that “once in a lifetime” horse. I am one of those fortunate people. I’ve had many horses over the years, and still have several, but one of them I hold especially dear, and our relationship has surpassed any other relationship I’ve ever had with my equine friends. He is an Arabian/Quarter Horse Palmomino named Handsome and he has forever changed my life. This, as well as my love of history, has prompted me to research famous horses and their partners. For the first pair in this series, I will go way back to 433 BC to Alexander the Great and his mighty steed Bucephalus. Alexander, a boy of 13 happened to be present when a horse dealer by the name of Philonicus the Thessalian, offered a horse of the finest Thessalian stock to King Phillip II of Greece for 13 talents. A talent is an ancient unit of mass, possibly in gold, roughly the mass of the amount of water required to fill an amphora–a unit for measuring liquids or bulk goods. In Greece at that time, that amount was 26 kilograms. Those attempting to handle the horse could not control him as he thrashed about, rearing, kicking and biting anyone who came near. Seeing the behavior of this wild animal, King Phillip would not make an offer. Alexander, seeing at once the potential greatness of this amazing horse, told his father that if he could not tame the horse, he would offer the sum himself. Alexander’s keen eye and natural horse sense allowed him to immediately recognize the cause of the horse’s distress; the sight of his own shadow. Approaching the horse cautiously, Alexander spoke to him in soothing tones, stroked his neck, and grabbing onto the bridle, turned the horse’s face to the sun, thus obliterating the offending shadow. Sensing that no harm would come to him, the horse immediately bonded with the boy and allowed Alexander to mount. The two were inseparable for the next few decades leading men into legendary battles that would result in Alexander’s conquering of the western world. Bucephalus breeding was “of the best Thessalian strain’ and historians believe that his breed was Akhal Teke, still in existence today. The exotic desert breed is known for its elegance, power, and athleticism as well as hardiness and endurance. They are noted for their shimmering, metallic coats, long, narrow heads and necks, with most of the length from their eyes to their muzzle, long forward set ears and hooded eyes. They come in a variety of colors but the most coveted are the Palominos and Buckskins because their coats resemble spun gold. Bucephalus was gleaming black with a white mark on his forehead and one blue eye. 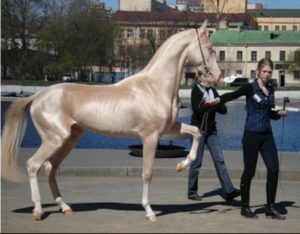 I found the description of the Akhal Teke conformation interesting because it is also said that Alexander named his horse Bucephalus because he was monsterous in size with a forehead that was”wide as a bull’s.” Sometimes in history, things get lost in translation, or perhaps as breeding continued throughout the ages, characteristics of the breed adapted to new uses, environments, etc. and the breed became more refined. The Alexander Romance legends that came about after his death, presented a different story of the relationship between Bucephalus and Alexander. It was said the two were born on the same day and that Bucephalus was a mythical creature more powerful than Pegasus. The Delphic Oracle told Phillip II that whoever could tame and ride the horse would be king. Furthermore, even in his lifetime, Alexander was seen as a god. In Alexander’s last battle, the Battle of Hydaspes, now known as Pakistan, Bucephalus was mortally wounded. Shortly after, Alexander founded a city and named it Bucephala in honor of his beloved horse. 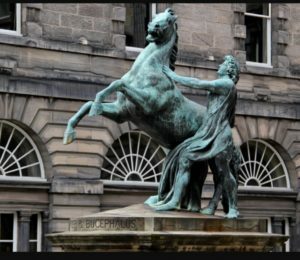 Have you heard of the story of Alexander and Bucephalus? Do you have a “once in a lifetime horse?” I’d love to hear your comments. Stayed tuned for more Great Horse Partners in History!